Our newest taxonomy release, available today, is the WAND Medical Administration Taxonomy. 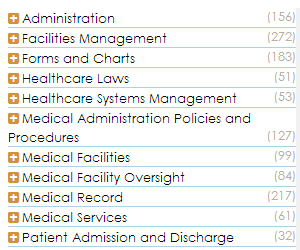 Top level terms in this taxonomy include Medical Services, Patient Admission and Discharge, Medical Records, Healthcare Systems Management, Administration, Facilities Management, Medical Facility Oversight, Healthcare Laws, Forms and Charts as well as Policies and Procedures. The WAND Medical Administration Taxonomy is designed for any medical related facility and includes 1343 terms and 386 synonyms. The document and record keeping in today's medical world can be daunting and the need to find that information has never been greater. That's where the WAND Medical Administration Taxonomy comes into play. The taxonomy can easily be customized to meet the individual needs of your facility, be it a clinic, short-term or long-term care facility, or hospital. There are many taxonomies available for diseases, such as MeSH or Snomed, but the WAND Medical Administration taxonomy fills a clear gap in the health care industry for a taxonomy of the administrative and management tasks, processes, and documents. This taxonomy, as with all WAND Taxonomies, is available by itself or as part of the WAND Taxonomy Library Portal. Today we are releasing the new WAND Electric and Gas Utility Taxonomy. This taxonomy is ideal for any energy utility company and includes 3047 terms. Top level terms in this taxonomy include Air and Environmental Safety, DSM and Renewable Solutions, Electric, Energy Acquisition Engineering and Planning, Energy Construction Operations and Maintenance, Energy Equipment, Energy Independence, Energy Management, Energy Program, Energy Regulatory and Compliance, Energy Supply Department, Form of Energy Fuel Type, Fuels and Materials Management, Hazardous Energy, Non-Renewable Energy, Power Generation, Renewable Energy, and Smart Technology. Logistics is a vital component of every business that buys, sells, or manufactures goods. Today, WAND is announcing the release of the WAND Logistics Taxonomy covering topics, documents, and processes involved in the movement of products, equipment and supplies. The WAND Logistics Taxonomy includes 1497 terms and 208 synonyms. Top level terms include Logistics Documents, Forward Logistics, Reverse Logistics, Transportation, Security and Safety, Service Providers, Warehousing and U.S. Customs and Border Protection Forms. 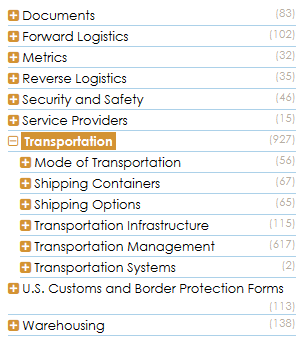 The taxonomy extensively covers Transportation including the Mode of Transportation, Shipping Containers, Shipping Options, Transportation Infrastructure and more. Today we are announcing the launch of SharePointTaxonomy.com, a new website designed to be a resource for people interested in learning more about how to use the great SharePoint Managed Metadata service, the SharePoint Term Store, and other taxonomy features in SharePoint 2010, SharePoint 2013, and SharePoint Online. SharePoint Taxonomy FAQs: This is a compilation of questions that have been asked over the course of 10 different sessions of WAND's webinar: Managed Metadata 101: Taxonomies and Tagging in SharePoint. These are common questions that attendees have had about various features, functionality, and best practices surrounding Managed Metadata and the Term Store in SharePoint. If there is a question you don't see on the list, feel free to submit one of your own and we'll be sure to get it answered. SharePoint Taxonomies: This is designed to be an educational site, but we have included links to all of the WAND Taxonomies that can be used in SharePoint and a video showing how users can access the WAND Taxonomy Library Portal to speed up the process of creating taxonomy metadata content in the SharePoint term store. We hope this becomes a popular and valuable resource for the SharePoint community. As always, if we can help you with a SharePoint taxonomy initiative, don't hesitate to contact us!